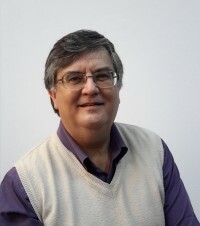 Professor Mircea Dumitru received his PhD in Philosophy in 1998 from Tulane University (New Orleans, Louisiana) with a dissertation on incompleteness in modal logic. He is also a Doctor in Philosophy of the University of Bucharest, with a thesis on neo-fregeanism and neo-russellianism in the semantics of propositional attitudes and direct reference. He specialized in philosophical logic, philosophy of language and the analytic metaphysics of modality. Professor Dumitru authored over 50 journal papers and chapters on topics such as modal logic, theories of truth, meaning, rationality, Wittgenstein’s thought, contemporary logic with a focus on Quine, Kripke, and Kit Fine, realism, essentialism and relativism. His research and teaching competence covers philosophical logic, symbolic logic, philosophy of language, metaphysics of modalities, epistemology, as well as philosophy of mind and of the conscience. In addition, he translated into Romanian works by Nozick, Nagel, Wittgenstein, Quine, Forbes, Kripke. Professor Dumitru has been the Rector of the University of Bucharest since 2011 and a member of the Romanian Academy since 2014. Between 2011 and 2014 he was the President of the European Society for Analytic Philosophy.